Football collectors are fired up that 2014 Upper Deck Football is now available in stores with plenty of time before the 2014 draft. 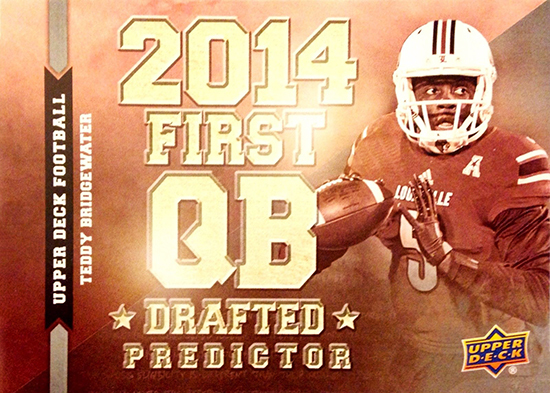 With every pack of 2014 Upper Deck Football opened, that is really what collectors are looking forward to; the 2014 draft. They want to see which players go to which teams so they can feel out whether they are put in a situation where they can thrive or where they may have to play second fiddle for awhile. Upper Deck wanted to capitalize on fan interest in the draft by bringing back Predictor cards that have been enhanced based on feedback received from past Predictor experiences. These cards are a perfect example of how we incorporated collector feedback to deliver a winning experience. If you have the Predictor card for the first player selected at a given position, you will score a limited-edition set of all the players for that position! Fans wanted to make sure the cards we create that could be exchanged for a more premium set had collectible aspects to them. For 2014 Upper Deck Football we came up with a great design, incorporated the athlete into the card, avoided having any scratch off elements and focused on the core skill positions with Quarterback, Wide Receiver and Running Back. The Predictor cards are also a hobby exclusive. With a great design that incorporates the player combined with the cards being a very tough pull, 2014 Predictors are collectible in their own right. Many hobbyists felt that pulling a Predictor card wasn’t very special because they were very common. In 2014 Upper Deck Football we made the cards extremely rare falling only 1:1,440 hobby packs. With these cards being so limited, collectors who pull them after the promotion ends will still be happy to have such a limited card of a top prospect. And cards that are not winners will still be very collectible. Frequently collectors have to wait the first half or entire season for previous Predictor programs. 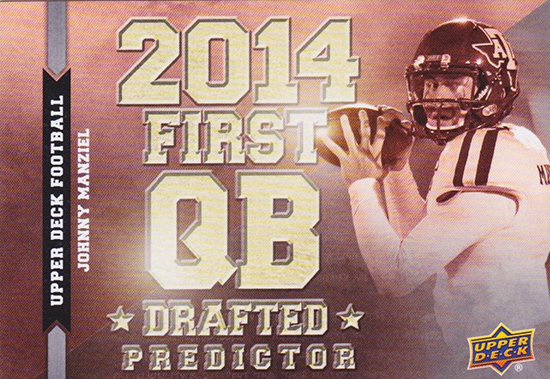 This time around fans just have to wait for the 2014 draft and with their Predictor cards in hand, the draft will be more exciting than ever. If the Quarterback, Wide Receiver or Running Back card you have is selected first over all, you will win a full set of all five of the prospects for that position. Should a sleeper come in, those holding wild cards will receive a set of all five prospects on the checklist along with a sixth card of that wild card player. It should make the draft a lot of fun. Upper Deck will begin production immediately after the draft and card sets should be available later on this summer. 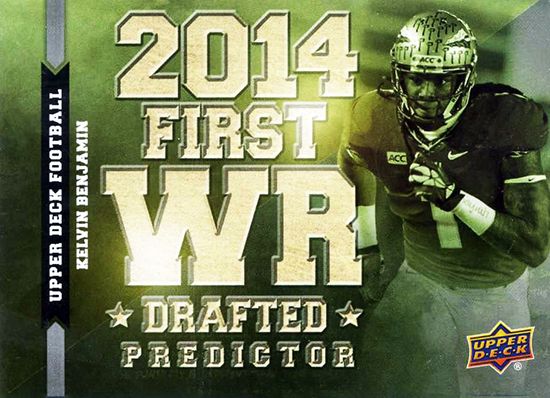 We “predict” collectors are going to love the new 2014 Upper Deck Predictor program! Chase down some of these cards today to make the 2014 draft an interactive collecting event!